By far the worst strategy is reactive boiler maintenance. This may be defined as repairs made only when there is a failure. There is no planning, no anticipation of repairs that may be required to prevent a failure. It is only when the equipment fails that the operators will evaluate the cause and then try to make the repairs. The costs associated with these boiler repairs are typically high both in labor, much of which is done on an overtime basis, and the associated downtime. By far this is the least desirable approach to boiler maintenance. A proactive maintenance program pays dividends in not only peak boiler performance but also in the overall safety of those working in the boiler plant. On the other end of the boiler maintenance spectrum is a proactive maintenance program. This type of maintenance approach uses scientific testing techniques and analysis to anticipate and correct, by either repair or replacement, problems before they arise. Real time monitoring has contributed greatly to the ability to view and respond to changes in boiler operation and overall process performance. Operators can compare past baseline results against current readings to determine if a problem may be forth coming. The key to properly analyzing boiler room conditions is having accurate data available. Boiler room logs are an important part of this process. Critical predetermined readings, such as fuel consumption and flue gas temperatures, are recorded on a daily or even a per shift basis. These recorded readings then give the operator a base line to compare present readings against. As an example, if the flue gas temperature of a boiler has gradually increased over the course of a month the operator will be able to evaluate the system. He might then determine that there has been a build up of scale reducing heat transfer. Keep in mind that every boiler operation is different. Some will require more extensive logs as opposed to others. 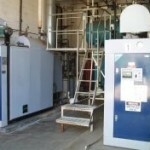 This is an area that management and boiler operators must review and jointly decide upon.